WASHINGTON (AP) — As President Donald Trump struggled with mounting Republican defections over his emergency declaration to pay for a border wall, his acting White House chief of staff wasn’t on Capitol Hill cajoling former colleagues or in the West Wing making calls. It was a telling example of Mulvaney’s laissez-faire approach as he settles into a role that has bedeviled those who came before him. His predecessor, retired four-star Gen. John Kelly, tried to micromanage Trump but ended up grating on the president and antagonizing outside allies. Mulvaney has made clear he believes his job is to manage the staff and not the president, according to current and former officials and people close to him. And he’s OK with that. Mulvaney doesn’t try to limit whom the president speaks with or curb access to the Oval Office. He just asks that those who talk to Trump fill him in on what was discussed to avoid surprises. While former staffers compare the current atmosphere in the West Wing to the early, chaotic days of the administration, when the Oval Office had the feel of Grand Central Station, Mulvaney understands that’s how Trump likes it. It’s an approach that some outside the building question. Mulvaney’s tenure has coincided with an especially tumultuous time in Washington, beginning with the fight over border wall money that caused the longest government shutdown in the nation’s history. He was at the table in Vietnam for Trump’s abruptly terminated summit with North Korea’s leader and has watched as newly empowered House Democrats have launched investigations into Trump’s dealings. But by all accounts, Mulvaney is a happy warrior who generally gets along well with the equally blunt president, is well liked by staff and brushes off slights. Though Trump gave Mulvaney the job on an “acting” basis last December, Trump doesn’t appear likely to replace him anytime soon. Mulvaney has the added benefit of getting along well with Trump’s daughter Ivanka Trump and son-in-law Jared Kushner, both senior advisers with enormous internal power. Mulvaney, who has personal experience working in a family business, understands their unique positions. He built relationships with both as Trump’s budget director and has had dinner with their family. “He’s trying to do the best he can with what he has to work with,” said Leon Panetta, a former chief of staff to President Bill Clinton who also served as budget director, defense secretary and CIA director. Like others interviewed, Panetta said it would be impossible to serve as a typical chief in Trump’s White House. “All you can do is be there, respond to the president when you can, try to maintain some semblance of order and try to keep things at least halfway on track and not collapsing into total chaos,” Panetta said. 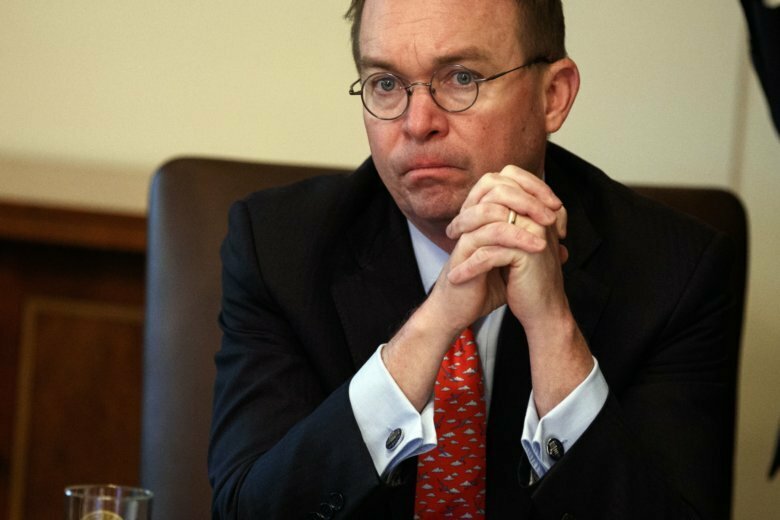 Mulvaney, who technically also retains the title of budget director , remains engaged in policy and budget issues, which made his absence in recent days especially notable. He left on Wednesday afternoon as the White House was mounting a final effort to try to stop GOP senators from backing a resolution to block Trump’s emergency order. Mulvaney was absent for Thursday’s vote, when a dozen Republican senators joined Democrats in rebuking the president. And he was still gone Friday when Trump issued the first veto of his presidency, overruling the vote to terminate his declaration. The White House defended Mulvaney’s decision to take the trip, which senior strategy adviser John Czwartacki said was part of a 25-year tradition. Czwartacki also said the president was fine with Mulvaney’s absence and that the chief of staff had a team in place empowered to operate without him. Mulvaney is “good at television, he’s good at communication. But I think at this point, he’s little more than an administrative assistant for Trump,” Cohen said. Mulvaney appears happy to be promoting Trump’s agenda, even when the president’s policies stand in conflict with ideas that Mulvaney has long championed. Other aides told Trump there was nothing he could do. But Mulvaney, a longtime fiscal hawk who had blasted former President Barack Obama for using executive action to dictate immigration policy, went back to his colleagues at the Office of Management and Budget and asked them to start identifying various sources of money the White House might be able to access without Congress’ approval to start building the wall.